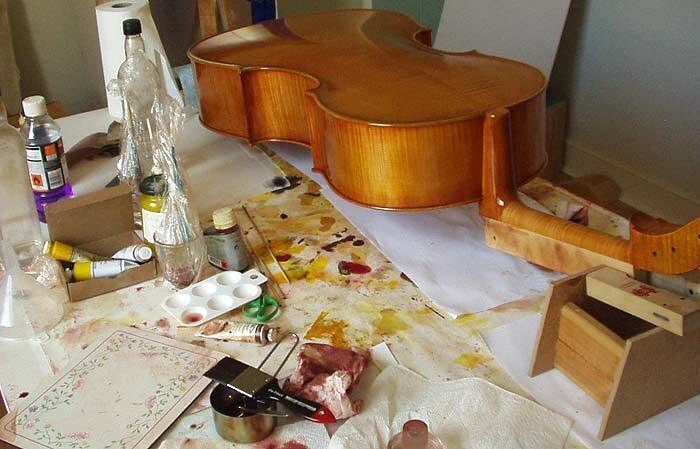 richingsviolins, bench pages, instrumens in progress. Instruments currently being made or just completed. Some general info on the way I work. I have two double bass now crowding out my varnish room ! Both owned by the same bass player - my Nephew. He seems to be good at breaking them. He plays for the band Beggar Joe. One has a broken neck stock - the other a split in the upper treble bout - and appears to be sprayed with six coats of epoxy varnish. So that looks to be fun sometime soon ! I have just started this instrument and intend to cover the entire build process as it goes on. See here for the start so far. This Cello, in Poplar wood is based on the Van Zweygberg - built in Piacenza, 1743 and was on loan to the Austrian cellist Martin Hornstein for a while from a major collection. I'm not sure who has it now. The original is 354 - 238 - 435 and a 737mm length. Mine has ended up slightly fatter and the ribs are 127 - 117mm. Blocks and linings are English willow. I am currently working on the neck and scroll - the top was recently completed and the back and ribs have been made for some time. I got a little sidetracked with the recent violas. The fingerboard has now been prepared. Its been shot with a romberg bevel and a compound connecting radius of 55mm at the crest opening out to 62mm at the A string edge. This should allow a closer clearance on the G and D - given the same scoop mid board. We shall see ! Now finished varnishing and set up. Will update images soon - See Flickr for current pics. 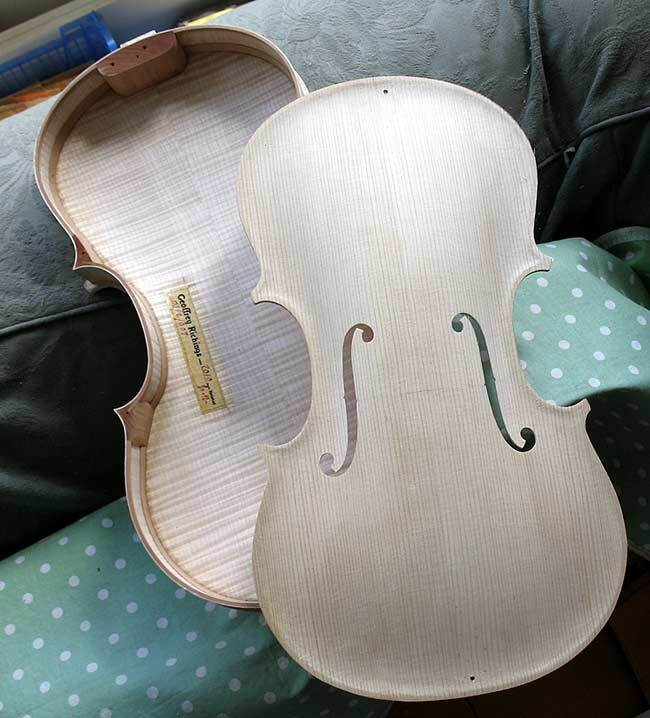 Now finished - along with the 'Lord Wilton' Strad I made alongside it. Will update images here soon - for now see Flick link below. See Flickr - Sets - 'Two new violins' for progress. A New Da Salo model Viola 16 ½ "
Same mould as the first Da Salo viola The Wood was a European maple cello neck block - which was so generous of proportion and deeply figured it seemed a waste. I converted it about a year ago - and it provided two complete sets for viola, back neck and ribs. Since it was quite hard I paired it up with a very open top wedge of Alpine spruce. Despite being the same mould they are very different in character somehow. I'm presently just about to set it up. Now finished and set up with Eva's. Will update pics here soon - see Flickr sets for current images. It is based on the Strad drawings of the Servais Cello which I had reduced, many years ago, to a body length of 750cm The back and ribs are European maple and the neck is English Sycamore. ( acer pseudo platanus) The top is a fine piece of very old Alpine spruce. It is strung with Larsen A and D - Spirocore C and G. Witner alloy tailpiece with a nylon covered steel cord. I have some sound trials arranged soon. A Photo Set on Flixr of this cello - Finished pics on the instrument pages. 2nd instrument off of the mould of the previous violin now completed. The Back is old Bosnian maple - and the top is Carpathian spruce. The ribs are English Sycamore and the neck European maple. Willow blocks - and unusually for me, the linings are spruce - just for change ! A Photo Set on Flixr - Finshed pics on the Instrument pages. A baroque violin in willow - made on the Bergonzi mould form. Finished and set up with Aquilla gut E, A and D - and an awful Chorda G ! Getting around to replacing the G with an Aquilla ( maybe a plan gut ) or even maybe a standard wound gut G ! 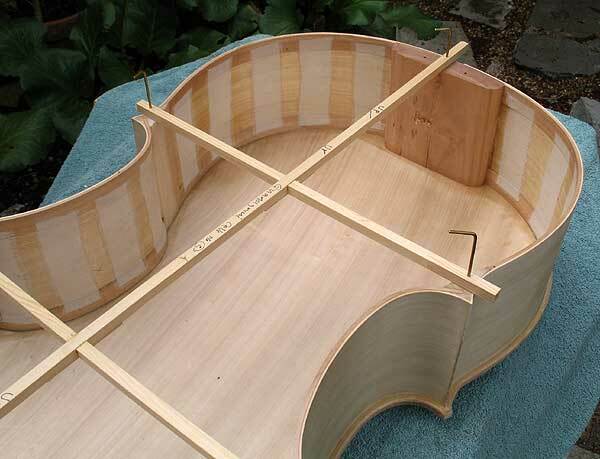 A Long Pattern Strad on the SL mould - based on a very acurate outline of Strad's original SL mould. Currently being varnished - see flickr. 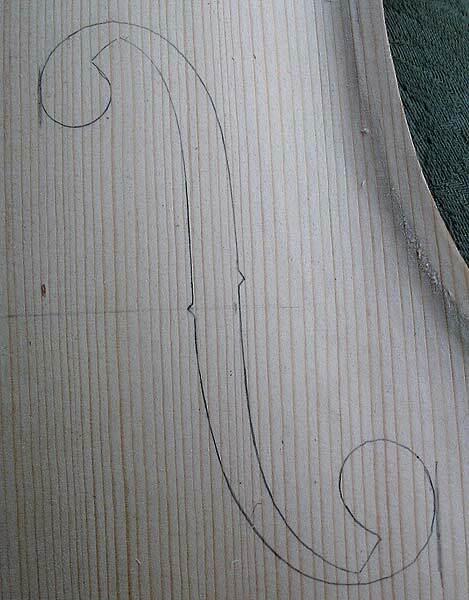 A rugeri violin 1686 - Just closed up the rib garland - tonight !